In the Texas Senate’s first public hearing since Hurricane Harvey, members of the Committee on Agriculture, Water and Rural Affairs talked for hours about a host of ways to mitigate flooding related to stressed reservoirs in the Houston region. NEW CANEY — Six weeks after the biggest rain event in U.S. history inundated large swaths of southeast Texas, a group of state senators convened in this small town north of Houston to discuss how best to address flooding related to the Houston area's stressed reservoirs. In the Texas Senate’s first public hearing since Hurricane Harvey, the Committee on Agriculture, Water and Rural Affairs talked for hours on Monday about a host of possibilities: dredging reservoirs and building new ones; better informing residents of flood risks and consolidating rainfall flood gauge data; capturing floodwater and storing it underground; and widening thousands of miles of bayous. In their testimony, officials from state and local agencies told the committee, whose members appeared keenly interested in specific price tags, that such projects would cost many billions of dollars. There appeared to be some disagreement on the panel about which solutions to prioritize — reservoir building over floodwater capture, for example. But regardless of which options the state ends up pursuing, committee members said the federal government should pick up most, if not all, of the tab. And they vowed a fierce lobbying effort to secure those federal funds. Sen. Lois Kolkhorst, R-Brenham, said sending billions of tax dollars to Louisiana and New York after Hurricane Katrina and Superstorm Sandy “was the right thing to do” and that Texas officials have much advocacy work ahead of them. “We cannot fail at promoting what I think are relatively small dollars in the grand scheme of what FEMA will end up paying out over the last three and four floods we’ve seen in Harris County and the surrounding areas,” she said. The hearing agenda included several issues Patrick ordered the committee to look into before the next legislative session. One was exploring ways to improve the capacity of two massive reservoirs in West Houston, Addicks and Barker, that filled up so much during Harvey that they backed up into thousands of homes and businesses. The U.S. Army Corps of Engineers, which owns the reservoirs, also was prompted to release an unprecedented amount of water from their earthen dams into a bayou downstream, which in turn flooded thousands more homes that would have otherwise been spared. Those releases caught many downstream residents off guard and sparked widespread rumors that the dams had failed — something the Army Corps said wouldn’t happen although it has considered them to be in poor condition for years. The other agenda items hit on that panic — how to ensure residents have “timely and transparent” information on how much water the Army Corps plans to release. Also, whether rainfall and stream gauge data should be “hosted in a centralized location” so residents and emergency response officials can easily monitor how much rain has fallen and how full streams and river have gotten. The issue also arose in areas northeast of Houston just after Harvey: hundreds of properties in Montgomery and northern Harris County flooded after the San Jacinto River Authority released an amount of water downstream that approached the average volume pouring over Niagara Falls. New Caney, where Monday's hearing was held, is in Montgomery County. Those river authorities, along with the Army Corps and Harris County Flood Control District, and other local officials have defended their communications during the storm, noting they followed agency protocols and had numerous joint press conferences. But it was clear some panel members are convinced they left residents in the dark. “The one thing that I can say that government did poorly, absolutely poorly [during Harvey] was notifying the public" about the releases and when it expected to increase them, said Sen. Paul Bettencourt, a Houston Republican. Later in the hearing, committee members sparred with river authority officials over their operations during Harvey, with Chairman Charles Perry, R-Lubbock, saying their "quasi-local, quasi-state" structure makes them prone to lapses in transparency. Improving information dissemination during major floods emerged during Monday’s hearing as perhaps the easiest and cheapest problem to fix. Bech Bruun, chairman of the Texas Water Development Board, reminded the panel that the Legislature had given the agency money to create a website — www.texasflood.org — after the 2015 Memorial Day floods that shows river and lake levels throughout the state and gives residents the best evacuation routes. The site could be bolstered to include more comprehensive statewide data, he said. Russ Poppe, the head of the Harris County Flood Control District, assured Bettencourt his agency will look into other “21st Century” solutions. A more complicated, contentious and expensive problem is addressing how much water ended up in lakes and reservoirs during Harvey. The two main solutions discussed Monday were building more reservoirs to ease the burden on existing ones — something Patrick said he personally supports — and dredging existing reservoirs or raising their dams to expand capacity. Both items would cost hundreds of millions of dollars. State Rep. Mark Keough, a Republican who represents The Woodlands area, described dredging as essential, telling the committee that Lake Houston has half the capacity it did in the 1950s when it was first built. But an official with the Army Corps demurred when Perry asked him if building and dredging reservoirs might help ease flooding problems. It might, said Byron Williams, chief of the Corps’ Project Management Branch. But the agency won’t know until it can study that option, and it hasn’t yet received funding from Congress to do so, he said. Sen. Brandon Creighton, a Republican from Conroe, bashed the Obama administration for not supplying enough money to build 19 reservoirs he said the Legislature designated for future construction a decade ago that he said could’ve eased flooding. But Perry, the chairman, said it’s “not realistic” to think building a bunch of reservoirs will fix the problem. Many of the reservoirs identified in the State Water Plan will never come to fruition in large part because of environmental regulations, he said. During Monday’s hearing, Perry repeatedly called for projects known as “aquifer storage and recovery,” which captures floodwater and diverts it into existing underground aquifers. Perry’s counterpart in the House, Lyle Larson, also is a big proponent of this method. "All I hear is reservoir development — that’s all I’m hearing — and we’re missing an opportunity to do a lot of things on a cheaper dollar," he said. 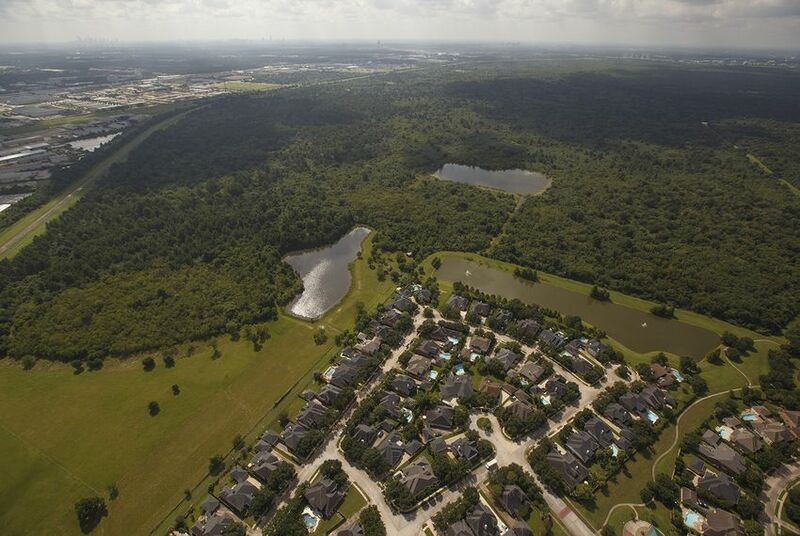 Houston officials let developers build homes inside reservoirs. But no one warned buyers.